Vehicle crews can benefit just as much from the soldier modernisation technologies being adopted by their dismounted brethren. 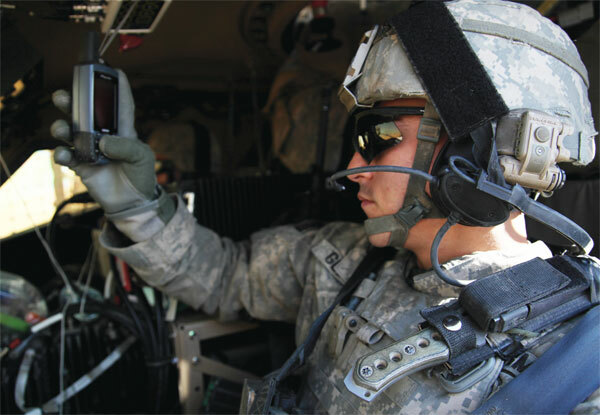 After successful use of the initial Helmet Mounted Display (HMD) of the Mounted Warrior programme in Iraq and now Afghanistan, the US Army’s Mounted Soldier System (MSS) is the next step on the path to transform the activities of commanders, drivers and gunners. MSS Increment 2 is bringing in a suite of three hardware subsystems; Microclimate Cooling, Cordless Communications and a new HMD, all of which will take part in a major network exercise and Limited User Test (LUT) later this Summer. The MSS LUT begins in June and is part of the Network Integration Exercise (NIE), a consolidated event where roughly a dozen systems including MSS will be tested at Fort Bliss, Texas, from June with the Capstone Exercise scheduled for mid July. Work on Mounted Warrior has transitioned to become Inc 1 of MSS. The Mounted Warrior HMD video display systems were first deployed with the 4/9 Manchu Stryker equipped battalion in 2007 in Iraq. Subsequently, in response to an urgent requirement, 51 systems were, in February 2010, dispatched to the 5/2 Stryker Brigade Combat Team (SBCT) in Afghanistan to be installed in their Stryker Reconnaissance Vehicle (RV). MSS Inc 1 was acquired only in limited numbers and no further acquisition is planned although further urgent requirements could be met as required. The next step will be to field Increment 2 which consists of three subsystems: a new HMD, a cordless communications system and a micro climate cooling system which will be integrated with the crew’s clothing and protection. From the LUT, the goal is to have a Milestone C decision in 4Q 2011, from Mid September onwards although that date has inevitably come under pressure along with other programmes, as a result of delays arising from the Continuing Resolution Authority. De-confliction between the multiple programmes to ensure components of the soldier systems are integrated across different platforms or clothing equipment is being achieved through the formation of an Integrated Project Team. Lt. Col. Rogers cites the areas of solder protective equipment and cooling and individual equipment as particular areas of interest for MSS. Conflicts in term of requirements are resolved via the TRADOC Capability Manager-Soldier who has the purview of de-conflicting soldier type requirements as far as material development is concerned. Within PEO Soldier, there is a Soldier Systems Integration team that also looks at the consolidated soldier requirements. There are no current unique clothing requirements for MSS although Lt. Col. Rogers said that the Plate Carrier, a new addition to the MSS Capability Production Document (CPD) can be used as part of the protection equipment that MSS crew members will wear. There are also no specific hearing requirements other than to meet the protection levels current CVC Helmets provide. Beyond MSS, there is work looking at technology insertion and pre-planned product improvement. These include implementing wireless SA to the crew members. Right now the video display is wired and the project team is looking at moving to a wireless connection. The current wired-only connect for the initial MSS as configured today effectively precludes a SA feed or any PLI when dismounted and un-tethered from cabling. How that is technologically achieved, remains to be seen.